Introduction Patients with lung cancer may present with additional lesions in the central airways. Earlier studies have shown a relationship between vessel diameter, pattern and grade of malignancy. High-definition (HD+) bronchoscopy with image enhancement techniques (i-scan) detected more vascular abnormalities but correlation with pathology has not yet been established. Methods In this investigator-initiated, randomised, controlled, crossover, multicentre study in patients with suspected lung cancer, a HD+ bronchoscopy was performed with i-scan1 and i-scan2 settings in random order. Biopsies, visual grade and vascular pattern classification were obtained by endoscopists and blinded evaluation. Results In 107 patients, vascular patterns were classified in 48 tumours. Abrupt-ending vessels were predominantly found in squamous cell carcinoma but overall correlation between vessel pattern and histology was not significant (p=0.339). Additional lesions were detected in 35 patients (33%) with a correlation between vessel pattern and high-grade (pre-)invasive lesions (p<0.001). In 8.4% of the patients, relevant second lesions were detected which determined treatment and staging in 3% of all patients. Interobserver agreement was excellent for visual grading of the airway epithelium, but low for classifying vascular patterns. No significant detection rate difference was found by blinded and unblinded evaluation. Conclusion HD+ bronchoscopy with i-scan image enhancement readily detects additional lesions. In one-third of all the patients, additional lesions were detected. Their vascular pattern correlates to pathology outcome, but the interobserver correlation for vascular pattern classification is low. These lesions were relevant in 8.4% and affected treatment and work-up in 3% of the cases. Trial registration number NCT02285426; Results. Can bronchoscopes equipped with real-time per pixel image enhancement technology detect more lesions with subtle changes in epithelial vascular patterns in patients with lung cancer, is there a relation between vessel pattern and pathology of tumours and/or premalignant lesions and are these lesions clinically relevant? This study shows that high-definition bronchoscopy with real-time image enhancement detects additional separate lesions in one-third of all patients and shows that the classification of vascular pattern correlates with the grade of premalignant second lesions. This study also shows that the interobserver agreement for classification of these vascular lesions is low and that clinically relevant second lesions were detected in 8% of the cases and influenced treatment in 3%, underlining the role for routine endobronchial evaluation in all new patients with lung cancer and the need for training to classify vessel patterns better. Bronchoscopy is one of the most important diagnostic procedures in lung cancer. This procedure not only aims to obtain a diagnosis but also renders important anatomical information. Furthermore, subtle changes in the airway epithelium and vascular patterns of the bronchial tree are clues to guide the endoscopist to the site of biopsy, help to determine resectability or local treatment in case of centrally located lung cancer and is the only tool to detect multifocal premalignant disease. Three meta-analyses showed diagnostic superiority of autofluorescence bronchoscopy (AFB) over routine white light bronchoscopy (WLB) in detecting premalignant lesions.1–3 The superiority of AFB over WLB is especially significant in older studies using fiberoptic endoscopes. The use of video-endoscopes further improved detection in the AFB setting.4–6 Yet AFB is not widely used and is available in a few specialised centres only. In the most recent guideline of the American College of Chest Physicians, the use of AFB is recommended ‘when available’.7 Uncertainty on the natural history and the risk of progression from premalignant lesions to invasive carcinoma and the high rate of false positive AFB findings further question its use.7 However, AFB surveillance in a high-risk group appeared to significantly contribute in detecting new tumours in high-risk patients with known preinvasive lesions where 62% of the lung cancers were detected by AFB compared with 38% by CT.8 In a time where endo-bronchial ultrasound (EBUS) often is being used as the first and sole diagnostic procedure in patients with suspected lung cancer, this finding may support the need for systematic bronchoscopic evaluation in all cases. Through technological improvement, new imaging techniques have become available in the form of high-definition (HD+) bronchoscopy. In combination with an improved video processor, this HD+ bronchoscope offers postprocessing real-time image enhancement (i-scan technology).14 In different settings, per pixel real-time adjustments can be made improving visualisation of minute changes in the epithelial layer (surface enhancement (SE)) and modify the colour spectrum (tone enhancement (TE)). In an earlier exploratory study, we found that HD+ bronchoscopy with i-scan image enhancement detected significantly more sites with abnormal and suspicious vascular patterns compared with routine WLB, AFB and HD+ bronchoscopy.15 In the evaluation of the gastrointestinal tract, real-time image enhancement has been shown to improve diagnostic yield.16 What the impact is of this i-scan technique with HD+ videobronchoscopy on the diagnostic performance is unknown. We hypothesise that image enhancement technology increases detection rate of synchronous lesions. In this prospective investigator-initiated multicentre study, we therefore aim to investigate the diagnostic performance in daily clinical use of HD+ bronchoscopy, with or without SE or TE and relate visual imaging to biopsy outcome of all detected sites with abnormal and/or suspicious vascular patterns in patients with suspected lung cancer. Furthermore, this study aims to determine if these findings as a result of systematic evaluation of the central airways influence clinical work-up or choice of treatment. This study is an investigator-initiated, randomised, biopsy-controlled, crossover, multicentre study. Each patient served as its own control for pathology outcome and for blinded versus unblinded interobserver agreement analysis. Patients with suspected lung cancer and an indication for diagnostic bronchoscopy following the local guidelines were included in four participating medical centres: Hospital Umberto I, Ravenna, Italy; St-Petersburg Research Institute of TB and Thoracic Surgery, Saint-Petersburg, Russia; Hospital Universitario Santa Lucia, Murcia, Spain; and Radboudumc, Nijmegen, the Netherlands. Exclusion criteria were ASA physical status ≥4, age <18 years, bleeding disorders, indication for the continued use of anticoagulant therapy, known allergy for lidocaine, known pulmonary hypertension, recent and/or uncontrolled cardiac disease, comprised upper airways, prior radiotherapy involving central airways, pregnancy and inability to consent. Patients were included from October 2014 until December 2016. Sample figures of typical bronchoscopy findings illustrating the effect of i-scan image enhancement technique and differences in vascular patterns. (A–C) A centrally located squamous cell carcinoma in the right main stem bronchus with high-definition bronchoscopy (A), surface enhancement (i-scan1, B) and the combination of surface and tone enhancement (i-scan 2, C). (D–F) Different vascular patterns are illustrated. (D) Tortuous or spiral vessels, (E) dotted vessels and (F) abrupt ending vessels. The order of different modes was randomised to avoid scope-induced and/or cough lesion bias. Videos were made for each mode and stored without patient identification information. All videos were reviewed separately by four experienced investigators (EHFMvdH, WH, OCJS and AvdV) in random order and blinded for initial classifications and patient outcome. The central airway epithelial abnormalities were visually classified individually by both the bronchoscopist and the blinded readers of the video’s following the scoring system categorised as normal, abnormal, suspicious and tumour.5 12 In this scoring system, the following definitions were used: abnormal is defined as visible area of erythema, swelling and/or thickening of mucosa, airway inflammation, fibrosis, trauma or granulation tissue. Suspicious was scored when nodular, polypoid lesions, irregular mucosa and/or focal thickening of subcarina was present. Tumour is defined as a visible endobronchial tumour and normal as the absence of any of the above.5 12 Vascular abnormalities are scored on vascular pattern following the Shibuya descriptors: tortuous, dotted and abrupt ending vessels (figure 1).11 13 This Shibuya classification was slightly modified; for this study, spiral and tortuous vessel patterns were grouped as one since differences between these two categories are difficult to define. With an estimated prevalence of additional lesions in 50% of the patients,12 13 15 the power analysis indicated that 130 patients were needed for this diagnostic study. Patient characteristics are given in means (SD) for continuous variables and in percentages or counts for categorical variables. Fisher’s exact tests (two-sided) cross-tabulation tests were used to investigate the correlation between prospectively assessed tumour sites and the found vascular lesions, and their histological outcome. Cohen’s kappa concordance was calculated to assess the interobserver agreement between prospectively (unblinded) and retrospectively (blinded) detected tumours and vascular lesions’ grading and classification. Wilcoxon signed-rank tests were used to evaluate differences between different image enhancement techniques in the blinded evaluation. Analyses were performed using STATA/SE V.11.2 software (Stata), and p<0.05 was considered statistically significant. 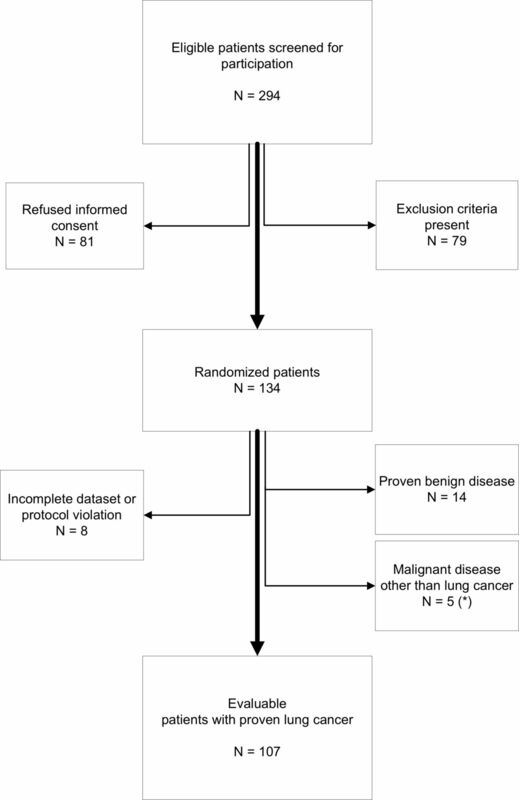 Of 294 potentially eligible patients, 134 patients were randomised and included in this study. From these, 8 patients had an incomplete dataset, 14 were shown to have a benign disease and 5 were diagnosed with a malignant tumour other than lung cancer (singular cases of melanoma, liposarcoma, mesothelioma, lymphoma and papillary adenoma). As a result, 107 patients with proven lung cancer were analysed (figure 2). Their baseline characteristics are summarised in table 1. Consort diagram i-scan multicentre trial NCT02285426 (clinicaltrials.gov). *The non-lung cancer diagnosis found metastasis of melanoma, metastasis of liposarcoma, malignant mesothelioma, pulmonary lymphoma localisation and a papillary adenoma. The most frequently found reason for exclusion in the screened patients was an alternative explanation found by CT or positron emission tomography scan for the presumed lung cancer suspected on chest X-ray on referral and prior radiotherapy treatment involving the central airways. Most lung cancers were located in the upper lobes, and based on imaging, suspected stage III lung cancer was most prevalent at the moment of bronchoscopy. The majority of bronchoscopies were performed under propofol sedation or general anaesthesia (respectively 36% and 26%) or moderate sedation using 4.7±0.4 mg of midazolam (23%). In 14% of the cases, no sedation was used. In 27% of the procedures, fluoroscopy guidance was used. The average study procedure time was 11±0.8 min (table 1). Complications were reported in 10 cases: 5 patients needed local application of topical vasoconstrictive agents; no severe bleeding or pneumothoraxes were reported (table 1). The visual grading and pathology outcome are summarised in tables 2 and 3; SqCC and AC were most frequently diagnosed. Control biopsy specimens were obtained when vascular lesions were detected. The pathology results from these control biopsy sites showed normal epithelium in 62%, inflammation in 36% and squamous metaplasia in 2% of the samples (table 3). In the 107 patients with lung cancer, the tumour target area was judged normal in 40 cases by the (unblinded) bronchoscopist, which indicates parenchymal localisation of the tumour beyond the visible part of the central airways and the subsegmental bronchi. In 56 cases, the target area was classified as tumour, and in 7 cases the epithelial surface in the target area was classified as suspicious (table 2). In the tumour target area, 48 vascular patterns were scored, abrupt ending vessels were most frequently reported (n=27, 56%) followed by dotted vessels (n=11, 23%) and spiral or tortuous vessel (n=10, 21%, figure 1, table 2). No clear correlation could be detected between vascular pattern and histology outcome in the entire group (p=0.339, table 4). When focusing on the AC versus SqCC, abrupt ending vessels were more often detected in SqCC but no significant correlation was reached between vascular pattern and subtype of NSCLC (p=0.116). Besides the tumour targets, 51 additional lesions were detected in 35 patients by the bronchoscopist not detected by the CT and/or positron emission tomography (PET) scans. In 22 patients, one additional lesion was detected; in 10 patients two, and in 3 patients three additional, anatomically separated, lesions. The visual grade classification of these lesions was graded as normal in 4 cases, abnormal in 35, suspicious in 9 and as tumour in 3 cases (table 2). Pathology outcome of the additional lesions detected is available for all 51 lesions and listed in table 3, and vascular pattern characterisation is reported in 50 lesions (table 2). Pathology outcome was grouped in two categories: normal to moderate dysplasia (low-risk/normal) and severe dysplasia to invasive carcinoma (high-risk/invasive). A significant correlation was found between vascular pattern and outcome (p<0.001, table 5). Non-target lesions with spiral/tortuous vessel pattern were significantly more frequent in the benign group whereas abrupt ending vessels were only detected in the high-grade dysplasia to invasive carcinoma group. As described in the ‘Methods’ section, the bronchoscopist responsible for the diagnostic procedure inspected the bronchial tree with all three imaging modes in random order (to avoid systematic scope lesions) and subsequently sampled all abnormal lesions and performed all diagnostic procedures as indicated and following local protocol. Four readers blinded for all patient and procedure-related information retrospectively analysed the videos of the bronchoscopy in random order and scored all abnormalities independently. The interobserver analysis summarised in table 6 shows excellent correlation on the visual grade classification (Cohen’s kappa >0.6) for all imaging modalities and poor to moderate correlation on the vascular pattern classification (Cohen’s kappa >0.2, table 6). In the blinded evaluation, less lesions were reported using SE imaging mode (i-scan1, p=0.0353, table 7) and significantly more vascular lesions using SE+TE imaging mode (i-scan2, p=0.0050) were reported compared with the HD setting. Visual grade classification was not different between the different settings. Overall the total number of lesions detected with visual grading and vascular pattern classification was not significantly different between blinded and unblinded reading (p=0.0631 and 0.1489, respectively). In 11 lesions found in nine patients (21.6% and 8.4%, respectively), a clinically relevant diagnosis was obtained from an anatomically distinct location. Pathology outcome in these lesions ranged from severe dysplasia (n=1) to invasive malignancies (AC (n=7), SqCC (n=1), carcinoma in situ (n=1) and low-grade salivary duct cell carcinoma (n=1))18 (table 3). In two patients, this finding resulted in additional treatments with curative intend, in one patient proof of stage IV due to contralateral pulmonary metastasis was obtained preventing additional diagnostic procedures. In the remaining six patients, tumour, node, metastases (TNM) stage was influenced but disease stage not altered, mostly since stage IV disease was diagnosed based on extrapulmonary metastases. Details of these individual patient characteristics and findings are listed in table 8. This investigator-initiated, randomised, controlled, crossover, multicentre study shows that i-scan image enhancement technology in diagnostic bronchoscopy readily detects vascular patterns in airway epithelial layer. In this study, approximately half of the patients presented with endobronchial visible tumours. Additional lesions were detected with HD+ bronchoscopy and image enhancement techniques in one-third of all patients. From these detected lesions, 22% had a clinical relevant pathology outcome, potentially influencing treatment. These lesions were found in 8.4% of the patients and altered treatment or prevented additional procedures in 3%. A significant correlation was found with pathology outcome and independently classified vascular pattern for additional lesions. Abrupt ending vessels and dotted vessel patterns are indicative for high-grade preinvasive or invasive malignancy. Characterisation of the vascular patterns on the visible tumours did not reach significance to differentiate but abrupt ending vessels were more frequently found in SqCC. In our study, the majority of patients where additional high-grade preinvasive or invasive carcinomas were detected had stage IV disease. However, our findings support careful full inspection of the airways to remain mandatory and HD+ image enhancement techniques will aid the detection and biopsy of such additional lesions. Follow-up bronchoscopy may be considered in selected cases and is indicated in high-grade premalignant lesions.7 8 11–13 With this study we do not advocate a role for HD+ bronchoscopy in lung cancer screening since the clinical relevance is too low. For daily use the ability to see and compare different settings of image enhancement techniques simultaneous seems the optimal setting but this cannot be established in this study. One of the limitations of this study is that the endoscopist was unblinded for the different settings and had to determine which lesions to biopsy. Therefore, when the blinded readers detect additional lesions, biopsy samples were available only when the initial endoscopist also had detected this lesion. In the blinded evaluation, the combined SE and TE (i-scan2) mode significantly more synchronous lesions were detected (p=0.005) and using SE significantly less compared with HD+ bronchoscopy alone (p=0.0353). However, in the interobserver analysis we found no significant differences between the blinded and unblinded detection rates. Combining multiple imaging modes may in fact decrease the number of false positives as described using AFB but our study cannot answer this question. A further limitation in the design of this study is that the used EB1990i HD+ bronchoscope has a working channel of 1.2 mm for which no disposable biopsy forceps was available. Therefore, for taking biopsies and all additional diagnostic procedures the bronchoscopy was continued after switching to a normal WLB. This may have resulted in suboptimal biopsy forceps positioning and sampling since small lesions may have been more difficult to detect without the HD+ image. Finally, we show that the interobserver agreement for vessel pattern classifications is low. Previous studies11–13 all used consensus-based classification which does not resemble everyday practice. Before the start of the study, all involved bronchoscopists were trained in the different vascular patterns and sample figures were included in the case report file for reference. However, given this low interobserver agreement and the fact that vessel patterns may not be uniformly present over the total surface of tumours, human error in classification will be of influence. In the gastroenterology, the need for better classification was also recognised16 and training has been underlined.16 19 In our experience, the use of simultaneous dual image viewing of both i-scan1 and i-scan2 (available on top-end video processors) is the optimal mode for rapid and thorough evaluation and classification. In conclusion, this multicentre randomised controlled study shows that i-scan image enhancement HD+ bronchoscopy readily detects centrally located tumours and detects additional lesions in approximately one-third of the patients with lung cancer. In a considerable number of patients (8%), these additional findings had clinical relevant pathology outcome and was the only factor to change stage and treatment in 3% of the patients. Abrupt ending or dotted vessels on these additional lesions are indicative of malignant behaviour and biopsies should be taken. Our findings support the importance of careful evaluation of the airways and addressing vessel characterisation as reported in earlier studies using NBI imaging11 13 but also shows that this classification is challenging and the interobserver agreement for vascular pattern classification is low. Additional training for correct classification of vascular patterns is strongly advised. In all patients with suspected lung cancer, the central airways should be carefully inspected and the use of HD+ bronchoscopes with image enhancement techniques helps detecting additional lesions which may influence treatment and follow-up strategy in a small subset of patients. The authors thank Priya Vart, PhD, assistant professor biostatistics at the Department of Epidemiology, Biostatistics and Health Evidence at Radboudumc Nijmegen for his advice and his statistical analysis. Tom Jansen MSc, Carlijn Tenbergen MSc and prof Ferdi van der Heijden from the Department of Robotics and Mechatronics and Medical Applications University of Twente, faculty Technical Medicine Enschede, The Netherlands, for their help and advice in this project in our attempts to develop an automated vascular pattern classification. Dr Irina Tabanakova MD, PhD, co-investigator at the St-Petersburg Research Institute of TB and Thoracic Surgery Center of Thoracic Surgery, Ligovsky str 2-4 Saint-Petersburg, Russia, for her help in collecting patient data. Finally, Linda Garms, clinical research coordinator at Radboudumc Nijmegen, the Netherlands, for her support and trial coordination. Contributors The study concept was initiated by EHFMvdH. The design of this study was critically reviewed by EHFMvdH, PC, IV, OCJS and WH. The manuscript was drafted by EHFMvdH and he is the corresponding author for this work. All authors have critically revised the data and the interpretation thereof, revised the manuscript and approved its intellectual content, and the accuracy of integrity of the work investigated. All authors have acquired patient data. Funding Unrestricted research grants and support from Ankie Hak foundation, Pentax Medical Systems Europe and Radboud Oncology Fund. Competing interests EHFMvdH reports unrestricted research grants from Ankie Hak Foundation, Pentax Medical Europe, and Radboud Oncology Fund during the conduct of this study. Outside the content of the submitted work EHFMvdH reports personal fees from Pentax Medical, grants and other from Astra Zeneca Oncology, other from MSD oncology, grants from Philips Medical Systems, non-financial support from Medtronic. WH reports grants from Insmed Incorporated, non-financial support from Novartis, personal fees from Insmed Incorporated. Ethics approval The study was approved by Central Medical Ethical committee Nijmegen, local medical ethical committee boards and registered in clinicaltrials.gov under identifier NCT02285426. Data sharing statement All relevant and obtained data are presented in this manuscript. For further inquiries please contact the corresponding author.